But, your center doesn’t show up on the first page of Google. And should they search deeper and find a link to your site, the site itself is not very nice, it looks dated and they don’t even spend time reviewing. In other words, they leave quickly and don’t consider you! Now is the time to improve your digital marketing BEFORE additional, potential residents like those mentioned here even start their search. 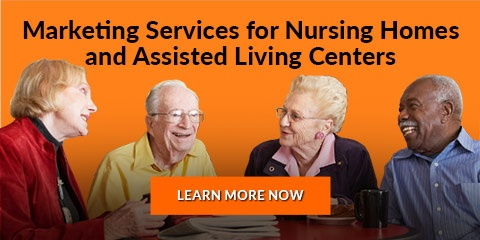 Every day people are searching for a nursing home or assisted living center online. According to a report from Flieshman-HIllard, 89 percent! of consumers turn to Google or another search engine to find information on products, services or businesses prior to making purchases. While print media still has marketing power that you need to consider, the internet provides the powerful initial opportunity to be seen by your best prospects. You need to start OR improve your digital marketing strategy now. Here are 5 ways you can improve your Google ranking and get your nursing home website in front of an interested audience. In the attached graphic I’m showing a sample SERP (Search Engine Results Page) from Google. I’m going to break down this page to show you what you are looking at and how you might be able to improve your ranking for each section. Google’s algorithm is pretty good at showing results you would be interested in. So when you type the keyword phrase ‘Nursing Homes near me’ OR 'Assisted Living Centers', one of the first results shown is usually the Local Search Results which are highlighted with a box and are shown with a map (labeled in the image). You can influence these results by making sure your site is listed on the Google My Business listing pages. You’ll need to start by creating a Google Account. Very easy to do and it’s free. Just go to the upper right corner of any Google SERP page and sign in and follow the instructions. Once you have a Google account, you can open a Google My Business page and will be able to add your business name, address, hours, phone numbers, website. Even images can be uploaded. Another option you should consider is a Google + (Plus) page. Google Plus was originally created as Google’s social media answer to Facebook. It didn’t really work out for Google, but Google still factors these pages into their ranking algorithms. So, you should set up a Google Plus page for your home or center. I know, it’s one more thing to do. But trust me, it will be worth it. As you can see the Local Results take up quite a bit of the first page landscape, and it's well worth the time to get your site listed here. One more item to set up is Google Analytics. While not a ranking factor item, this freemium web analytics service from Google tracks and reports website traffic and a host of useful information from your web traffic. A small line of code will need to be added to your website programming to start gathering data. I’ve found many nursing homes and businesses that just don’t add this service to their website. It's invaluable to see what type of traffic you have, when you get it, what pages they view on your site, how long they visit, and much more! Pay Per Click ads are just that. When someone clicks on an ad, your account is charged for that click. This is set up through Google Adwords. Bing, Facebook and other seach engines offer PPC advertising, too. Adwords are extremely effective for getting your product or service in front of people quickly that are searching now for that product or service. You could technically start an account and have an ad up AND on the first page of Google in a matter of hours. When Local Results are not shown, ads are always shown at the top of the page. 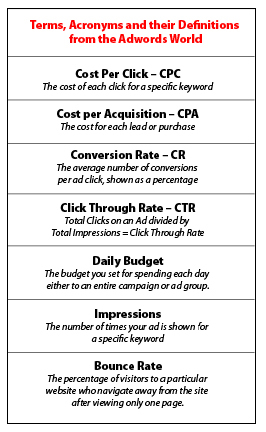 Clicks costs vary depending on the keyword(s) chosen. Google suggests a cost of $4.70 per click for ‘nursing home’ in my area. Usually ads are displayed at the top of the search results page. But, if Local Searches are shown, then ads appear at the bottom of the page. They are all marked with a small "AD" graphic on the left side to indicate they are paid ads. As you can imagine, you want to have your website in its best shape if you are paying $4.70 per visitor to get them there. And direct the click to the most relevant page to push the visitor to call or click your "call-to-action" button. Google Adwords is a fairly complex tool that can deliver great results. Your best bet is to hire someone to help you who has a record of success formatting and creating campaigns. If it isn't set up correctly you could quickly burn through a large amount of money. I have reviewed many PPC campaigns that lost money because they weren't programmed to target the right demographics and geography. Another version of a PPC method to increase site traffic is to make use of your social media site ads through Facebook. With almost 2 billion users on Facebook, your audience is there. You just need a relevant eye-stopping ad to put in front of them. Targeting can be very specific with location options, job titles and specific interests such as nursing home care. Video ads can also be used with great effect. That way you can visually hone into the specifics that set your center apart from others. Like Google Adwords, if not set up properly you can blow through a lot of money for clicks. These listings are non-paid search results compiled by the Google search engine using complex algorithms to rank websites. There are many factors that influence your rank within these organic results. There are also many more tactics that could be used to increase your ranking, but they all come under the banner of "Search Engine Optimization" or SEO. This is where Google ‘s algorithm comes into play that you’ve heard so much about. Maybe you heard of the Panda update? The Penguin update? And just this year there was the Fred update. All these updates were made to Google’s algorithm to help show the most relevant results for your search query. Many factors go into what the best results are, BUT don’t be alarmed, you can still make headway into improving your ranking results even if you are just getting started. Responsive Site Design: Your website automatically formats to the devise the vistor is using. Did you know that 60% of ALL searches are from a mobile device? If your site is NOT mobile friendly, that is built to display well on a mobile device, you need to make those changes. Google now takes into account whether your site is mobile friendly as a ranking factor. Voice searches are greatly influencing the search results as well. Rather than typing short keyword phrases, many searches by voice are getting to be longer 5 or 6 word keyword phrases. This is where a great website makeover OR at least a landing page for the ads will come in. Here’s an article on creating websites and landing pages that convert. Conversions are visitors that either phone OR fill out a form on your site and request more information or a meeting. Are you using a CMS (content management system)? It’s not necessary, but many do use them and it makes it building your website easier plus there are many inexpensive extensions that can add functionality to your site. Wordpress is a CMS. Blogs are usually built on a Worpress site, making it easy for the client to add fresh content regularly. All too often, I see websites that use stock photography and I think the public is onto this tactic. The images look like ‘generic’ healthcare photos. And many sites use similar OR even the same photos others are using to depict their center. Part of standing out from your competition is looking unique. Take the time and expense to do it right. Consider the daughter or son who is looking for a place for their mom or dad. They want to see what the rooms and common areas look like. First impressions are so important. Is your site content written to persuade? Will it convince a prospective family to contact you? What separates you from your competition? You need to emphasize the difference. Google loves to see content. That is, articles or text that is informative to the public about the keywords you claim to own. So, if you can create content either around your center OR around a topic that is associated with your center, that will help increase your ranking for that keyword or search phrase. The type of content that Google likes is content that keeps a visitor on the page longer. Google can tell how long a visitor is on your site and a visitor that stays longer is an interested visitor. An interested visitor tells Google you’ve got something on the page that will be of interest to others also searching for that topic. It builds upon itself - more traffic brings better results which brings more traffic. As you can imagine there is a whole industry that is centered around Content Marketing. That is supplying content that visitors find through search queries. The idea being that once they are on your site, a visitor will find other pertinent pages that will earn their trust and get them to ‘raise their hand’ or contact you. So put your blogging hat on and get to work brainstorming subject matter that will be relevant to those that search for your business. A possible tactic you should consider is giving your audience something they might want to download. Such as a comparison chart. Where does your center stack up with the competition? Show your prospects in an easy to download PDF that require their name and email to download. By having an email address, you now have the ability to contact them again and follow up with messages to help convince them of your uniqueness. This is a great way of turning visitors into leads and push the leads through your sales funnel. Another tactic to rank your site higher is to make sure your website is keyword optimized. That’s where the Title and Description come into play. Title and Descriptions are text areas that only show in the html coding of your page. Google relies on these pieces of coding to help categorize your pages. A title tag is the main text that describes a web page. It’s a flag to Google to tell them what to expect on your web page. Every page can have its own title and description. A description is a 160 character piece of text that summarizes a page’s content. These should contain keywords similar to the page title but not a repeat of the keyword. These usually show in the Google SERP as the descriptive text UNDER the link to the web page. They can be useful in telling the searcher what specifically they’ll find on that page. And if written correctly, can be the final piece of text to persuade them to click. Always include your city / state / zip on your website. That can usually be accomplished by adding them to your footer. But they can be included in your page title too. Don't forget to prominently offer a phone number. A backlink is any link from anther website to a page on your website. Generating backlinks to your site is a win for your ranking. Google sees links as votes for your site. The more votes you have, the higher Google will rank you. Some sites have more back link ranking power such as .edu or .gov sites. So getting a link from them could be a powerful boost. But .com sites still can get you there. The more relevant a backlink site is to your content, the better the ranking power as well. Consider listing your site on other web search engines such as Yelp, Yellow Pages and any local business directories. Take advantage of free directories. I wouldn’t pay for any links unless you are sure you’ll get traffic that converts from them. Another tip if you are creating content, is to create one page per keyword. If you want to rank for multiple keywords, don’t try to stuff them all onto one page. It does not work. It confuses Google and dilutes the effect. An extension of any or all of your marketing is the creation of a ‘Drip’ email program. A 'Drip' email program is a series of automated emails written to re-engage your contact, educate them about your center and turn them into hot leads. I like to coordinate all the marketing efforts so your emails can include a push to read a new blog that was published, download a resource that provides answers to issues at different stages of the buying cycle. Tracking the leads you have (where they came from, what assets they accessed from you, did they visit or called, etc) is important in the writing strategy and implementation of the campaign. There are email lists that can be purchased - people who have triple opted in - that could be appropriate. Or you may find it useful to email your contacts at hospitals that refer patients to your facility. That would be written differently. I've just touched upon key aspects of the different marketing opportiunities that can help you fill your rooms. These all take an investment of time and money whether you partner with an outside professional or try to do-it-yourself. Consider the leads you are missing out on if you delay working on these marketing tactics. Not sure what you should do or which to do first? I'll provide a complimentary 15 minute strategy call. Call 888-337-0066 or click the link or use the form to schedule a time with me. Call Today 888-337-0066 or fill out this form for a complimentary 15 minute marketing consultation.